Habit: Perennial herb; hairs +- scale-like. Stem: decumbent, branched. Leaf: entire to +- deeply pinnately lobed. Inflorescence: axillary, cluster, 1--5-flowered. Flower: calyx in fruit +- enlarged but not bladder-like, open at top; corolla +- rotate, tomentose between stamen bases; anthers free, generally < filaments, opening by slits; style 1. Fruit: berry, spheric, partly enclosed by calyx. Seed: +- flat, reniform. Stem: 1--several from base, 5--25 cm. Leaf: 15--50 mm. Inflorescence: pedicel 8--18 mm, in fruit < 3 cm, recurved. 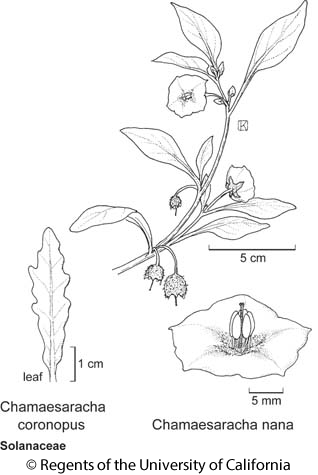 Flower: calyx +- 5 mm, in fruit < 10 mm, lobes in fruit 2--3 mm; corolla +- white; filaments 5 mm. Fruit: 1--1.2 cm wide. Seed: 1.5--2 mm. Chromosomes: n=12. Citation for this treatment: Michael H. Nee 2012, Chamaesaracha nana, in Jepson Flora Project (eds.) Jepson eFlora, http://ucjeps.berkeley.edu/eflora/eflora_display.php?tid=18896, accessed on April 19, 2019. CaR, SNH, GB; Markers link to CCH specimen records. Yellow markers indicate records that may provide evidence for eFlora range revision or may have georeferencing or identification issues. Purple markers indicate specimens collected from a garden, greenhouse, or other non-wild location.